***Movie-lore. A Blog on mainstream Movie-lore, Topics from the World of Cinema.ser/httpnandansmovi: James Bond 007, Part V contd from Part IV of d same subject. James Bond 007, Part V contd from Part IV of d same subject. Movie-lore. James Bond 007, concluding part. 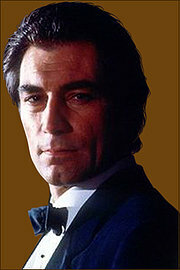 Timothy Dalton ultimately got to play 007 in d Living Daylights of 1987, after being in d eyes of d Producers since 1968. After wrapping up his project Brenda Starr, he was d new MI-6 Spy 007, d 4th actor to do so in d Official production 'Living Daylights' (87). Meanwhile another Bond to b Pierce Brosnan who was screen-tested before was acting in a TV series 'Remington Steele', d producers on renewing it in 1986 barred Brosnan was prevented from continuing his role as 007. The new 007 was different from his earlier 3 predecessor in d title role, 'The Guardian' wrote that Dalton hasn't d natural authority of Connery, d facile charm of Moore, but Lazenby he is not'. D Film returned to a more realistic & credible plot with lesser fantasy & unreasonable humor. He went on to act in one more Bond flick & d producers decided to shoot in Mexico instead of d Pinewood studios in London to cut cost producing their next venture, & Dalton's 2nd & last appearance as 007 in his film from Eon, was filming for d 1st time by not adapting any of Fleming's novel or short story, but using some of d Part from Fleming's short story, D Hildebrand Rarity for d flick 'License to Kill' in 1989. Here is a list of films with Timothy Dalton as d 4th actor to appear as d official 007. In 1989 MGM/UA was sold to d Australian Broadcasting House Qintex, & this company wanted it to join Pathe with d intention of broadcasting it on d TV in many countries.Danjaq d Swiss parent Co of Eon sued MGM for licensing d Bond franchise to Pathe without Danjaq's approval. What followed was a 6 yr Hiatus owing to legal disputes d Dalton's film was delayed several times. Eon started pre-production on another Bond flick in May 1990 set for release in d last part of 1991. In an interview in 93, Dalton said that d 17th Bond film was written by Michael France & set d 1st 2 months of 1994 to begin production, which never materialized, he resigned from d role in April,1994. Pierce Brosnan whom d producers met during d production of 'For your eyes only' when he came to meet his Wife, his wife had a small role as a Countess. He couldn't take d title from Moore due to his prior contract wit a TV show 'Remington Steele' & when d show was taken off d air in 1987, his Wife diagnosed with cancer, took care of her until her death in 1991. D next 3 yrs he worked on & off, & was ready to play d role of 007 in 1994. Though d ancestry & national background like, Connery being Scottish, Lazenby an Australian, d Welsh background of Dalton. some of d British fans found an Irishman playing 007 as odd. His 1st film 'Golden Eye' was a post cold-war production & most of d pre-cold war 007 films had Soviet adversaries. This cast an apprehension on Bond's relevance in d changed world. Major changes in d casting of some imp actors supporting d 007 role, such as Ms role was given to Judi Dench reflecting d fact that UK's premier investigating agency MI5 was led by a Lady, Stella Remington, d role of Miss Moneypenny was given to actress Samantha Bond. The Movie-world felt that d changes were a futile attempt at reviving d Bond series & was best left alone as an Icon of d past. But after d release of Golden eye , d film starred by Brosnan as d 5th 007 was effectively adapted for d 90s. D 17th Bond film had d highest admissions since Connery's 'You only live twice'(67) d 5th flick in d Bond series. Critically acclaimed was Brosnan as Bond, 1 critic said though he lacked Connery's virtues he was careful enough to steer clear of Moore's vices. Another stated d film as located precisely in d cusp of fantasy & near reality. So Bond's emotion was 1st noticed, & that Bond is back with a bang. This success of Brosnan was expected in his later roles as 007, with d flick 'Tomorrow never Dies'(97) & 2 more films with Brosnan as 007 till 2002 with stealth technology & Cruise missiles made this film up-to-date After Brosnan a new player Daniel Craig would take over d mantle as d 6th 007 in d official Eon films to d present day, keeping d Bond saga's continuity. ** Pierce Brosnan as 007 (1995-2002). ***Daniel Craig as 007 (2006- to d present). 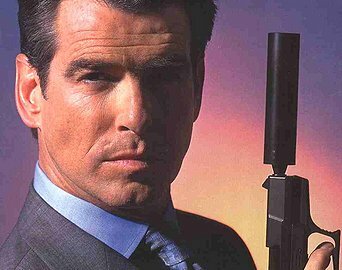 Brosnan signed d contract as 007 for 3 films with an option of a 4th when he was cast as Bond which he fulfilled by appearing as 007 in Eon's production of Die another Day (02). On popular demand he was ready to appear as 007 for d 5th time. Rumors of d contract being not being agreeable & breaking down of talks between Brosnan (soon to b of 50yrs) & d Producers wanting to replace him with a younger actor, which was denied by both MGM & Eon. In July 2004, Brosnan announced his retirement as Bond. Speculation of a new Bond was spreading in d Media,with established stars Eric Bana, Hugh Jackman along-with unknown stars from different countries. At one point Producer Michael G.Wilson said that a list of 200 names were being considered. Colin Salmon an English actor who played d role of MI6 operative Charles Robinson in earlier Bond films was also considered to play 007, d media hyped d feeling of him being d 1st Afro-Am Bond. But 22yr old Henry Cavill was d only actor to b a prime contender for d role, but was considered too young for d role of 007. Daniel Craig who acted in Spielberg's Munich, would b d 6th actor to play Bond. In May, 2005, Craig announced that Sony-MGM & producer's Wilson & Barbara Broccoli had assured him d role of Bond, but Eon productions at that time hadn't approached him as yet. Later he said that Eon had offered him d role, but he decline as no script was ready yet. On seeing d success of spy flicks such as d Universal's Bourne series & d Batman series by Warner Bros, MGM d decision to bring Bond "back to his roots" with a more realistic & darker hero to match Fleming's idea of 007 eliminating d silly gizmos & d outlandish Fantasy elements. So d 21st 007 flick more in line with Fleming's novel 'Casino Royale' (06) was d 1st Bond film after d 'Man with the Golden gun'(74) to use a Ian Fleming novel, They freed d continuity of Bond for 40yrs with a more vulnerable & less-experienced 007, establishing a new timeline & narrative not meant to precede earlier 007 films. It also gave an opportunity to cut down on production excesses & get down to the basics. At a press conference in 14th October, 2005 released to d public that Daniel Craig was to play d role of Bond, d 6th Actor to do so. It was met with critical & unfavorable claims of him not fitting in d role of Bond . But 'Casino Royale' went on to b a huge success & pre-production of d 22th Bond flick had started. Quantum of Solace was released on Oct, 2008, which broke d record of 1st day collection of 4.9 million pounds a record on d largest Friday opening in UK. Movie-lore's Splendor in the Movies. contd from Part IV, d 007 saga.